I lump Q.U.B.E. 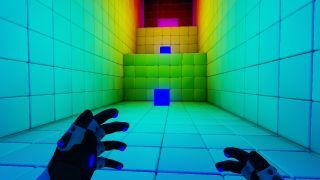 in with a few other first-person puzzle games that came out after Portal proved that that can be a successful genre. Like Quantum Conundrum, for example, it wasn't as brilliant as Valve's masterpiece, but so few things are. It had fun, clever puzzles, and it didn't really bother me that it didn't have a story to tie them together. It was relaxing that way, like playing a really elaborate Sodoku puzzle. But that changes with the release of Q.U.B.E: Director's Cut , hopefully for the better. That sounds a little existential, like the properly-spelled movie Cube . Rachel Robinson, who's best known for portraying Fang in Final Fantasy XIII, will voice the lead and seemingly lone role. Q.U.B.E: Director's Cut costs $14.99/£9.99, but is currently discounted by 15 percent. If you already own Q.U.B.E., you're entitled to a 50 percent discount.